For other uses, see Constanța (disambiguation). Constanța (Romanian pronunciation: [konˈstant͡sa] ( listen); Greek: Κωνστάντζα or Κωνστάντια, Konstantia, Bulgarian: Кюстенджа or Констанца, Turkish: Köstence), historically known as Tomis (Ancient Greek: Τόμις), is the oldest continuously inhabited city in Romania. It was founded around 600 BC. 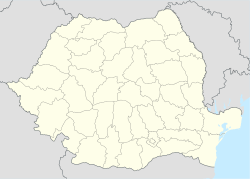 The city is located in the Northern Dobruja region of Romania, on the Black Sea coast. It is the capital of Constanța County and the largest city in the region of Dobruja. As of the 2011 census, Constanța has a population of 283,872, making it the fifth most populous city in Romania. The Constanța metropolitan area includes 14 localities within 30 km (19 mi) of the city, and with a total population of 425,916 inhabitants, it is one of the largest metropolitan areas in Romania. In 1878, after the Romanian War of Independence, Constanța and the rest of Northern Dobruja were ceded by the Ottoman Empire to Romania. The city became Romania's main seaport and transit point for much of Romania's exports. The Constanța Casino, which is both a historic monument and a modern symbol of the city, was the first building constructed on the shore of the Black Sea after Dobruja came under Romanian administration, with the cornerstone being laid in 1880. On October 22, 1916 (during World War I), the Central Powers (German, Turkish and Bulgarian troops) occupied Constanța. According to the Treaty of Bucharest of May 1918, article X.b. (a treaty never ratified by Romania), Constanța remained under the joint control of the Central Powers. Allied troops liberated the city in 1918 after the successful offensive on the Macedonian Front knocked Bulgaria out of the war. Constanța is one of the warmest cities in Romania. It has a humid subtropical climate (Cfa), with oceanic and semi-arid influences. There are four distinct seasons during the year. Summer (early June to mid September) is hot and sunny with a July and August average of 23 °C (73 °F). Most summer days see a gentle breeze refreshing the daytime temperatures. Nights are warm and somewhat muggy because of the heat stored by the sea. Autumn starts in mid or late September with warm and sunny days. September can be warmer than June, owing to the warmth accumulated by the Black Sea during the summer. The first frost occurs on average in mid November. Winter is milder than other cities in southern Romania. Snow is not abundant but the weather can be very windy and unpleasant. Winter arrives much later than in the interior and December weather is often mild with high temperatures reaching 8 °C (46 °F) - 12 °C (54 °F). The average January temperature is 1 °C (34 °F). Winter storms, which happen when the sea becomes particularly treacherous, are a common occurrence between December and March. Spring arrives early but it is quite cool. Often in April and May the Black Sea coast is one of the coolest places in Romania found at an altitude lower than 500 m (1,640.42 ft). As of 2011[update], 283,872 inhabitants live within the city limits, a decrease from the figure recorded at the 2002 census. As of 2014[update], an article of INS said that the population of Constanța grew, the city having at the end of the year 319,678 inhabitants living permanently within the city limits. A2 motorway, also known as "Sun's Highway"
In the early 2000s, the city bought 130 new MAZ buses to replace the aging fleet of DAC buses. The entire fleet is now made up of buses from the 2000-2008 period, which are painted in distinctive bright colors, such as pink, yellow and green. There is also a fleet of double decker Volvo buses that run in the summer, providing access to and from the resort of Mamaia. As of October 2013, the cost of a return ticket is 3 lei. In July 2018 Constanța municipality signed an €18 million-contract to acquire new buses manufactured by the Turkish company Anadolu Isuzu. There are also plenty of private minibuses (similar to a share taxi) which run along longer and more intricate lines. The price of a minibus ticket, as of October 2013, varies between 1 and 2 lei depending on the operator. Carol I Mosque, Constanța is the centre of Islam in Romania. The museum is the largest institution of this kind in Romania and it hosts precious evidence concerning the development of the country's military and civil navy. The idea of founding the museum was outlined for the first time in 1919, but it was materialized only in the late 1960s at the initiative of Nicolae Ceaușescu, when the Romanian Navy Museum was officially opened on 3 August 1969. Museum collections capture models of ships, knots, anchors, navy uniforms. It has also a special collection dedicated to important figures who made history in the Romanian navy. Prices for a single ticket range from 5 RON to 10 RON. Constanța is home to several football clubs, with FC Viitorul playing in the Romanian first division and SSC Farul playing in the Romanian second division. There are two rugby teams in Constanța: RC Farul Constanța, who play in Divizia Națională BRD, and Constructul Cleopatra Constanța, who play in Divizia A. One of the top Romanian handball clubs, HCD Constanța, is also based in the city. Olympic champion gymnasts Simona Amânar and Cătălina Ponor were born in Constanța. Răzvan Florea, swimmer who won bronze medal at 2004 Summer Olympics was also born in Constanța. World number 1 in tennis Simona Halep is also a native of the city. ^ a b c d "Population at 20 October 2011" (in Romanian). INSSE. 5 July 2013. Retrieved 16 June 2016. ^ Strabo (1877). "Book 7, Chapter 6". In Meineke, A. Geographica (in Greek). Leipzig: Teubner. ^ "Constanța". Romanian Tourist Office. Retrieved 2009-04-18. ^ Jordanes. "The origin and the deeds of the Goths, Chapter X". ^ The Cambridge Companion to Ovid ed. Philip Hardie p.235. ^ "Cazino Constanta". Litoralul Romanesc. Retrieved 27 March 2018. ^ "Article X of the Treaty". Retrieved 14 December 2018. ^ "World Weather Information Service – Constanta". World Meteorological Organization. Archived from the original on July 26, 2017. Retrieved July 25, 2017. ^ "CLIMAT summary for 15480: Constanta (Romania) – Section 2: Monthly Normals". CLIMAT monthly weather summaries. Ogimet. Retrieved July 25, 2017. ^ "AIR TEMPERATURE (monthly and yearly absolute maximum and absolute minimum)" (PDF). Romanian Statistical Yearbook: Geography, Meteorology, and Environment. Romanian National Statistic Institute. 2007. Retrieved March 21, 2015. ^ "Constanța Climate Normals 1961-1990". National Oceanic and Atmospheric Administration. Retrieved March 21, 2015. ^ "Klimatafel von Constanta (Konstanza), Dobrudscha / Rumänien" (PDF). Baseline climate means (1961-1990) from stations all over the world (in German). Deutscher Wetterdienst. Retrieved November 23, 2016. ^ "A Handbook of Roumania". Archive.org. Retrieved 2012-06-30. ^ 2011 census results per county, cities and towns "Structura Etno-demografică a României". Edrc.ro. 2011-12-28. Retrieved 2012-06-30. ^ "Populația stabilă după etnie – județe, municipii, orașe, comune" (XLS) (in Romanian). Institutul Național de Statistică. Retrieved 2015-11-23. ^ Stoica, Vasile (1919). The Roumanian Question: The Roumanians and their Lands. Pittsburgh: Pittsburgh Printing Company. p. 77. ^ "GhidTuristic.Ro: Județul Constanța" (in Romanian). Retrieved 2 December 2008. ^ "Cuget Liber: Constanța are 3.144 de firme noi, în primele șase luni din 2008" (in Romanian). Retrieved 2 December 2008. ^ "Port of Constanța Ranking". www.eosnap.com. 2010-10-19. ^ "Șantierul Naval Constanța: Despre noi". Retrieved 2 December 2008. ^ Juler, Caroline. Rumunia. Przewodniki National Geographic (in Polish). National Geographic Polska. ^ ILiNC. "Regia Autonomă de Transport în Comun Constanța | Home". www.ratc.ro. Retrieved 2016-06-27. ^ "Internet gratuit în autobuzele RATC. Wireless în toate mijloacele de transport din Constanţa". www.digi24.ro. ^ "Anadolu Isuzu signs 18 mln euro bus supply deal with Romania's Constanta". seenews.com. 13 July 2018. Retrieved 14 December 2018. ^ "2014 Constanta-Mamaia ETU Triathlon European Cup | Triathlon.org". www.triathlon.org. Retrieved 2016-01-26. ^ "2016 Constanta-Mamaia ETU Triathlon Premium European Cup | Triathlon.org". www.triathlon.org. Retrieved 2016-01-27. ^ "Les jumelages de Brest". Mairie-brest.fr. Archived from the original on April 3, 2009. Retrieved 2009-07-07. ^ "Kota Kembar Makassar-Constantia". Ali Mochtar Ngabalin. Archived from the original on 2010-12-15. Retrieved 2010-01-25. ^ "Twinning Cities". City of Thessaloniki. Archived from the original on 2009-03-31. Retrieved 2009-07-07. ^ "Eight Cities/Six Ports: Yokohama's Sister Cities/Sister Ports". Yokohama Convention & Visitors Bureau. Archived from the original on 2009-08-27. Retrieved 2009-07-18. Wikimedia Commons has media related to Constanța. This page was last edited on 15 March 2019, at 18:35 (UTC).